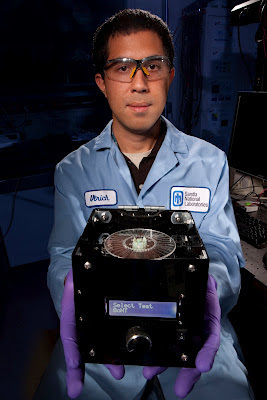 Sandia’s Ulrich Schaff holds a prototype SpinDx, a portable instrument that can determine a patient’s white blood cell count, analyze important protein markers, and achieve results from other tests in a matter of minutes. A medical diagnosis is performed to determine a possible disease or disorder a patient has. Based on the results, a medical diagnostic opinion is reached. The procedure of a medical diagnosis involves classification tests and measurements of the physical, biological, and mental state of the person. This is usually the first step and a major factor in determining the patient's health and well being. Lab officials are seeking industry partners to license and commercialize the SpinDx technology, which can determine a patient's white blood cell count, analyze important protein markers, and process up to 64 assays from a single sample, all in a matter of minutes. "In a doctor's office, time is money," said Anup Singh, manager of Sandia's biotechnology and bioengineering department. "Patients have become accustomed to an initial visit, some tests, samples that are sent off to a far-away lab, a wait of a week or more for results, more tests and charges every step of the way. With SpinDx, you can see results before you even leave the office." The technology advances in SpinDx have profound implications for patient care. Heart attacks, strokes, infections, certain cancers and other afflictions could be detected days or weeks sooner than they are today, with no new burdens placed on patients or their doctors, Singh said. Small sample size: Patients merely have to provide a pin-prick sample of blood. 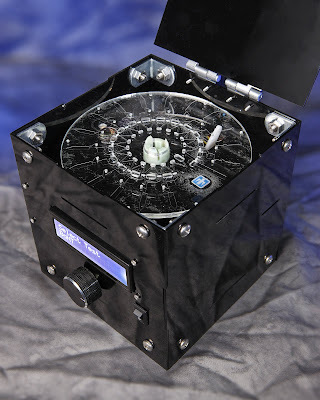 Ease of use: The device uses a spinning disk, much like a CD player, to manipulate a sample. The disks contain commercially available reagents and antibodies specific to each protein marker. Custom applications: Singh envisions a "plug and play" approach whereby the physician chooses among a "cardiac disk," "immune disk" and similar options. Inexpensive technology: The disks — the crux of the technology — cost pennies to manufacture. Quick response time: Results can be delivered to the physician's computer in 15 minutes. "We envision medical personnel using SpinDx routinely," said Greg Sommer, the Sandia researcher who spearheaded development of the project. "Instead of standard blood panels and costly lab tests, a SpinDx disk would be processed right in the office while the medical office staff is gathering routine data like temperature and blood pressure." The platform also has homeland security and food processing applications. Singh recently led a National Institutes of Health grant (grant # 1U01AI075441) to adapt the lab-on-a-disk platform for toxin diagnostics. The device could be the most accurate method available to detect the botulinum toxin, said Sommer. Caused by the bacteria Clostridium botulinum, the botulinum toxin is one of the most toxic substances known—a miniscule quantity can deliver a lethal dose. But despite scientific advances, laboratory mice remain the only reliable way to test for botulism. "The mouse bioassay is primitive, but remains the gold standard due to its sensitivity," Sommer said. "Our SpinDx botulinum assay vastly outperformed the mouse bioassay in head-to-head tests, and requires absolutely no animal testing. Plus there are a lot of cost and speed advantages." SpinDx technology uses a spinning disk, much like a CD player, to manipulate samples. The disks cost mere cents to manufacture. While botulism is quite rare — only about 145 cases are reported in the United States each year, according to the Centers for Disease Control and Prevention — the lethality of the toxin makes it an attractive candidate for bioterrorism. "A very small amount in the food system could harm a lot of people," said Sommer. Sandia's goal, Sommer said, is to create a handheld, point-of-care device that can be used in the field by emergency responders. SpinDx's ability to process many substances also makes the device relevant for food safety testing. About 15 percent of botulism cases are food-borne. In 2007, 14 people in seven states contracted botulism from chile sauce due to faulty manufacturing equipment at a food plant in Georgia. The Sandia team made improvements to the assay that enabled it to handle thick, viscous food substances. Collaborators at the U.S. Department of Agriculture provided high-quality botulinum antibodies that bind with high affinity, enabling higher sensitivity. "Food processing plants are looking for something that can be integrated into their assembly lines," said Sommer. "Our device will be suitable because it's fast, inexpensive and simple to operate." The team is developing a deployable prototype to run the assays, with the goal of a fully integrated, automated device for field testing. "We've done most of our testing in a benchtop setting, where we spin the sample on the disk and then read it out on a microscope," Sommer explained. "The next step is to automate those processes and get the system into users' hands. SpinDx has a lot of potential for so many applications."